some excellent suggestions there! Here's my own ideas (some original; some taken from other games). Some are good; some may be dumb, some may be pretty radical. alterations to existing elements: Up to 8 colors (red, green, yellow, blue, orange, purple, black, white, gray) of keys/doors/toggle walls/toggle bombs Rover: needs some major overhauls but I don't have good ideas on improvements; other than it might be very interesting to be able to pre-program a specific path the rover takes, almost like having another player automatically doing things in the level. 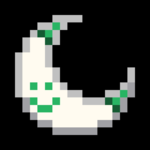 Have more enemies that can pick up and use items! NEW TILES: black hole: everything except ghosts are killed in black holes. All blocks disappear forever in them. Chip can only walk over black holes with the hover boots cracked floor: has up to four types: this floor can be walked on once, 2, 3 or 4 times until it breaks depending on how cracked it is. black hole is underneath the floor> it turns to this after being stepped on. Enemies follow all the cracked floor rules except ghosts Maybe you can put other things (like fire) under cracked floor? cracked ice: works similar to cracked floor but has same properties as ice and water is underneath spikes: kills ants, centipedes, walkers, balls and blobs. Can be turned on and off with a button. Chip can also walk over them safley with the hover boots lava/Volcano: similar properties to fire but all blocks except stone blocks will be destroyed in it. Enemies except fireballs die in it. A Volcano spews lava from it and the lava will spread around the level somewhat similar to the way slime can be spread. tortoise: a moving monster which is NOT an enemy; works like a moving turtle but never sinks. Chip can ride a tortoise across water and (maybe) other obstacles. boat/train: objects allowing chip to cross water/tracks & safe from enemies but doesn't have free movement; must follow a set path. Boat is "docked" at land (so it's not an item like flippers, same for train). Coin Door: door to be opened only with a coin (item to be picked up). Door can be passed only once per coin. ricochet block: pushing on it will push blocks and enemies adjacent to it away. These can be linked to interesting effect (from the game Enigma) swap block: swaps places with adjacent tile when pushed on (literally any tile other than floor) puzzle piece block: blocks with different symbols that fit together and form bigger blocks. These larger "tetris"-piece-like blocks can be moved as one unit. 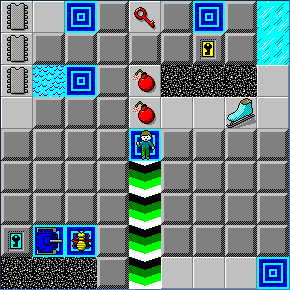 Currents: a current in water pushes chip and enemies and some blocks (beside stone blocks) in a set path. mail system: items dropped into the mail tile get sent (with button press) to other mail station. Items must be picked up before placing more. Multiple levels Ability to walk 'ontop' of walls or canopies by using a staircase or something similar or multiple layers/levels? New types of blocks: wood/plastic/stone/metal With different interactions, most notable: wood is destroyed in water and everything plastic can float in water (pushed around like on floor) dirt blocks turn into gravel in lava metal blocks become stuck to force floors stone blocks block just about everything like currents and cannot be destroyed by bowling balls or lasers. magnet: pushes or pulls on metal blocks with switch. russian nesting blocks: 3 or 4 blocks which all must first be pushed together into one to have effects like hold down a button or other things. ITEMS: hazmat suit lets chip walk on slime (does not erase it) soap chip erases slime by walking on it. hover boots lets chip walk over spikes and black holes magic satchel increases inventory (to 8 slots) (this item does not sit in inventory as normal, but is separate) hammer allows chip to destroy blocks (cannot move them while carrying hammer) (someone, I think Chipster, had this idea on discord): item that lets you place or change wires during game somehow. ENEMIES: octopuse: shoot ink in laser like fashion (something like the Chuck's challenge enemy) walker 2.0 movements: like blob, speed: like walker or normal enemy Chessmen: For a long time I had the idea of enemies that follow movement patterns of chess pieces like the knight but if you think about it this seems pretty tricky to impose and maybe not that interesting.